Not many exhibitions first confront the visitor with a giant gold teapot and an equally large pair of boots, but then ‘British Folk Art’ is distinctly different from most exhibitions. Tate Britain’s overview of ‘folk’ art – a difficult category to define – is full of charm and whimsy, while at the same time offering a rigorous analysis of folk art’s various permutations and contexts. Wisely, the show doesn’t attempt to formulate a catch-all definition of folk art, instead preferring to let the objects tell their own stories. 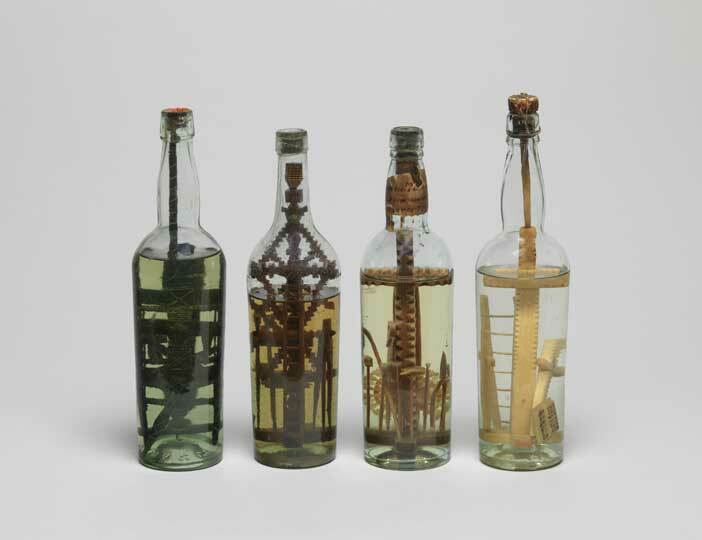 However, some distinct themes do emerge: for example, the relationship of folk art to practical function, in the form of shop signs and quilts; or the importance of talismanic objects, including the mysterious ‘gods in bottles’ and some impressively monumental ships’ figureheads. Such a complex concept needs a nuanced approach, and this has been managed with care. The text, which is plentiful and helpful, constantly introduces surprising ideas – such as the possibility that supposedly ‘naive’ art could be produced and sold in a very deliberate manner, as with the fabric collages of George Smart. Perhaps the most profound realisation, for me, was the idea of object as palimpsest. Because folk arts – crafts such as embroidery, woodworking or weaving – have rarely been considered to have the same cultural value as establishment art, people have not been afraid to alter and intervene. More than any academic painting or sculpture, the objects on show here create a narrative through their history of usage. It’s interesting to note that the vast majority of objects on display here are loans – with the exception of Alfred Wallis’ seascapes, which shows how important the legitimating effect of inclusion in a major collection can be on our perceptions of artistic worth. So far outside the canon are most of these works that, up until now, they haven’t come under the aegis of a major art gallery (as opposed to a museum of social history). Of course, their display by Tate throws up an immediate confrontation: folk art, by and for ‘the people’, on show for a fee in an elite metropolitan institution. To its credit, the show addresses this directly, acknowledging the difficulty in determining what, exactly, constitutes folk art, and the responsibility of mediating between the object’s history and its new audience without being arbitrary. Authentic, inventive, pragmatic and delightful: ‘British Folk Art’ is exactly like the works it brings to our long-deserved attention. ‘British Folk Art’ is at Tate Britain, London, until 31 August.